The following is an email my son sent me from Iraq where he is stationed. In the course of performing his duties, he travels the length and breadth of Iraq every month if not more often. During the four years he has been there, his eyes have seen it all, up close and personal. The good, the bad and the ugly. How he or the other young men and women who are serving there, are able to function in such an area, is amazing to me. My heart is moved, each time he send me a fresh batch of photos. I am touched by the heroism and bravery of our forces. I am delighted by the historical and often biblical places he chooses to photograph. I laugh at the antics of Soldiers during their downtime, as they seek to find a lighter moment in a very heavy world. But, I am most touched by the photos of the children that live in a war torn country. I wonder as I look at each small face if they will grow to adulthood. I wonder if they will have hearts that are filled with hate for America or if they will remember the kind Soldiers, who tried to help them and think this is what all Americans are like. This picture says they will remember us with trust. However, if we leave there too soon and leave them to the fate that will surely await them, they will remember us with a raging hatred, because we deserted them in a time of need. I wish I had his ability to write it all down with such eloquence. I could never make the words fall into the right order, as he has, when trying to explain what my heart knows to be true. So, read his words and try to understand that there is much more at stake than the bottom line of the cost of war. There is a way of life at stake, and freedom is not free. The Soldier in the above photo is not someone I know. In fact, I cannot make out the unit patch the Soldier is wearing nor do I have a clue where in Iraq this event occurred. But that is all as it should be, because I believe this to be one of those signature photos that define a war. We’ve all seen the photo of the Sailor kissing the girl in Times Square at the conclusion of WWII, the photo that inspired the Iwo Jima memorial, and the footage and still photo of the execution in the middle of a Saigon street. These images captured the essence of a war and the feelings and emotion that the war elicited. These types of photos do not necessarily bring about a good feeling about a war, but rather they serve to capture what the war is about…the meaning and the spirit. 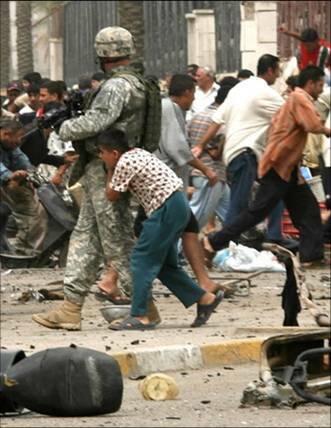 This photo does that, at least for me, about this war here in Iraq. If you look closely at this photo, you can see debris from an explosion littering the area. It appears to have been taken in a market area and there are many civilians around. The Iraqi civilians are running away, but not the Soldier. He’s moving toward the danger and looks prepared to engage. But obviously, the most meaningful part of this photo is the boy hiding behind the Soldier. He’s not running away either, but rather seeking safety behind the Soldier. He obviously trusts the Soldier enough to think that his odds are better behind the Soldier than running away. That is telling in my opinion. This is what this war is about…but many politicians don’t get it, and millions of American’s are equally clueless. They would have us abandon our efforts and these people….cut our losses…say to the Iraqi people “we tried, but we just couldn’t do it”, or maybe “hey, we were wrong for coming and we’re out of here…this costs too much and we have other priorities.” I do not count myself among that crowd that feels this way. Why we originally came here is debatable, but it is now an irrelevant and ridiculous discussion. It just doesn’t matter anymore. WE ARE HERE! Our actions left this country and her people unable to protect themselves from outside influences. Those outside influences (read Iran and radical Islamism) want to turn Iraq into an extreme theocracy, and that outcome would be bad for long-term American stability. If we depart too soon, this country will surely drop into the abyss of civil war and the outcome is questionable. But whatever that outcome, we will leave looking inept and surely, no other nation will EVER trust us again in the foreseeable future, and that can’t be good for American security. The world will point to the violence that is sure to follow our departure and rightfully blame us. The instability brought about by a premature departure of our military would almost certainly turn large parts of Iraq into a safe haven for terrorist organizations, and that too would be bad for American security. Departing now would also signal weakness to other rogue nations that wish us ill, and again…that would be bad for our security. I say all of that to make the point that we are here now to further long term American security interest. Our uniforms say “U.S. Army” and we fight for OUR nation, not Iraq. But a residual effect is that we are protecting many people, like the young boy below, who would be victims of the violence that would follow are departure should we leave too soon. This boy obviously believes that the U.S. military is a force for good that will protect him. Otherwise, he would hide behind the Soldier. So back to why this photo was so striking to me. We can’t tell who the Soldier is, nor even what unit he is from. He is just a Soldier, like the Sailor in Times Square…unknown, but yet representative of the many thousands of other Soldiers. He is not running away, nor does he appear to shrink from whatever danger is nearby. He appears to embody all we as Soldiers hold to be important; bravery, valor, and the willingness to stare down the enemy where he chooses to show himself. This entry was posted on March 6, 2008 at 11:39 am and is filed under call of duty, harms way, letter from Iraq, Soldiers. You can subscribe via RSS 2.0 feed to this post's comments. Hi… love this blog – will come to it often. I was trying to find out how to get in touch with you about sending things to Iraq. I would love to send homemade goodies, but won’t get an honest response from my stepson as to whether it made it there in edible shape. Hi! glad you like my blog. Have trouble getting to it at times, but I’m trying. I never was one to sit long on a fence, but was always fast to jump, landing on my chosen side. I am in process of writing an article on How to send gifts to our Soldiers in Iraq. Hope it will help you. Probable will post it later today. Best wishes and prayers for your step-son in Iraq. May God be with you all as he serves his country.